Andy Schleck continued his gradual return to form today, clocking up a small but important result in the GP Città di Camaiore in Italy. The RadioShack Leopard rider rolled in 91st in the race, crossing the line five and a half minutes behind the winner Peter Sagan (Cannondale Pro Cycling). The result is modest by his standards but given the serious fracture he suffered in the Critérium du Dauphiné, the difficulties he faced in trying to get back on the bike and the 312 days which had elapsed since he last completed a UCI race, finishing today moves him a step closer to getting back on track. Prior to this afternoon, the last race Schleck completed start to finish was last year’s Liège-Bastogne-Liège. He crashed out of the Dauphiné and missed several months of racing due to the severity of the injury. He completed four stages of the Tour of Beijing last October but then withdrew on stage five; he looked set to finish this year’s Santos Tour Down Under, but a puncture at a bad time on the final leg led to him being stranded off the back of the bunch, and ultimately withdrawing from that stage. Directeur sportif Kim Andersen has seen the difficult times that Schleck has been through and expressed satisfaction about today’s result. “I’m happy about the comeback of Andy,” he stated. “On the second to last climb, he had to drop back with some twenty other riders, including Popo and Danilo. He finished the race and was in a good mood. We are headed in the right direction." When in his top form, Schleck is one of the very best stage race riders in the world. He was named 2010 Tour de France champion after Alberto Contador was stripped of the title, and also finished second in 2009 and 2011. This year’s route is both more mountainous and contains less time trial kilometres than the 2012 edition and so on paper it should suit him, although he has conceded that it might be the 2014 race before he is back to his full strength. Still, given that he is just 27 years of age, he has time on his side. 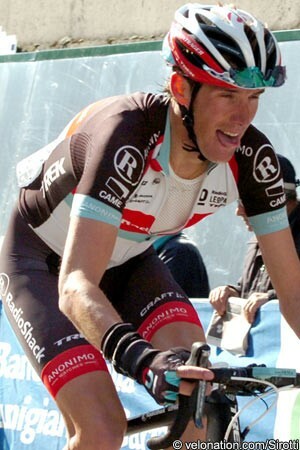 The team was also pleased by the performance of the American rider Matthew Busche, the 2011 national road race champion. He finished fourth today, just one step off a podium place, and showed that he is in strong form heading into the next races. Busche was part of the select group which went clear over the final climb. He responded to an attack by Sagan and Caruso on the false flat before the final descent and rode across to those two. He then paused rather than pushing on, and believes that this is where he lost out. The result is a promising one for the season, though, and so too the sensations that he is feeling. He’ll look to seize his chances in the next races, while Schleck will aim to keep making progress and inching closer towards reaching better form.